I made a deposit at the bank on Friday (12/17/2010). It was three checks, a total of $636.64. While I was there the teller myself and bank manager were discussing iOS (iPhone/iPod/iPad) and Android Apps (Capital One has just released an iOS app). The teller (Gary) handed my receipt, I stuck it in my pocket, and left. I went home; it was not until a couple of hours later that I looked at the receipt, and realized THERE HAS BEEN A MISTAKE! 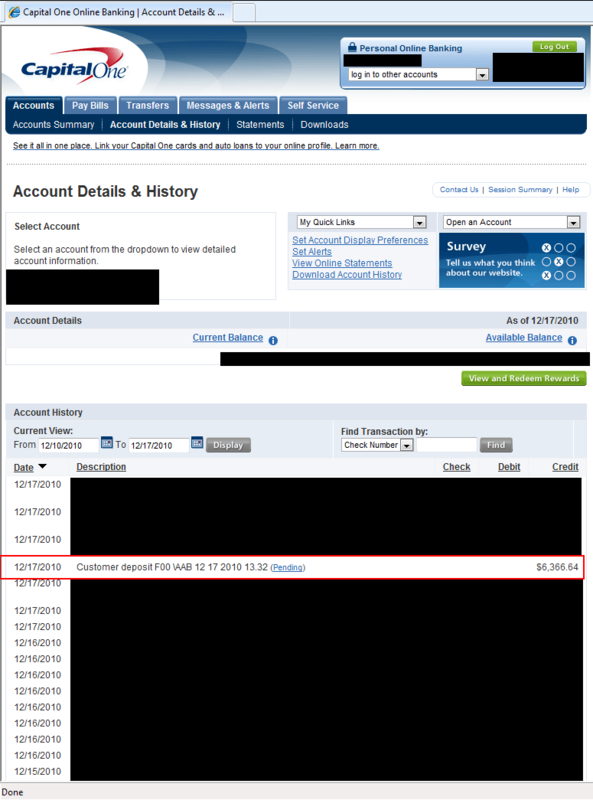 Gary had accidentally inserted and extra “6” in the total amount, bringing my deposit total to $6,366.64 ($5,730.00 above the true deposit amount). I then proceeded to wrestle with the Capital One phone system. I wanted to talk to Gary (without driving back to the bank), but with the Capital One phone system you have to dial the local number and then choose option “6” to talk to the local branch. I was able to get to Gary, but because all the deposits had been sent for the day (bank was open, cutoff time was passed) there was nothing he could do. Kyle: I made a deposit earlier, I was the guy who talked about all the phone stuff and CES. Do you remember me coming in? Kyle: Great, I just wanted to thank you for the Christmas present, but thought you might get in trouble for crediting me an extra fifty-seven hundred dollars. I explained what I had discovered, Gary then assumed it would get resolved when they check all the deposits at “the place we send all that stuff.” It was resolved, but not without another hiccup. Karah and I try to check our bank account every night, making sure everything we charged has gone though, bills have been paid, and nothing extra is appearing. And what we noticed was that on Saturday the bogus deposit was removed. But the correct amount was not deposited into our account until today (12/20/2010). Very frustrating. All the while we had several thousand dollars more than we were supposed to we dreamed of what we would do with the money. Karah would buy and iPad, I would pay off debts. You can see how dissimilar our thought patterns are sometimes. We both wanted to make sure we did the right thing and not spend any of it though (not made easier by them holding the proper amount all weekend). I do not know exactly what would have happened had we spent all the money, but I bet it would not have been pretty.